I’m fortunate enough to work in Export House, on the second floor. We partner with the IT company responsible for the live feed from the web cam, and so I was delighted for the opportunity to design and build the website and logo. It was great to get involved with the project. A couple of shots taken on different days of the adults coming in with lunch. About a month after installation the pair were seen entering the nest for the first time, and on March 1st copulation was observed. Then on March 22nd the first of 4 eggs were laid. This generated a huge amount of interest in the local community and beyond, and we were receiving around 4,000 hits a day on the site. On May 1st the first egg hatched, shortly followed by the second. Sadly, the second chick to hatch didn’t survive, but the third chick to hatch fared much better. The fourth egg failed to hatch and remained in the nest for the duration. It was fascinating to watch the two surviving chicks very quickly grow and get stronger. Visitor numbers to the site grew to round the 5,000 mark, and came from all over the world. We even had an Australian television company showing an interest in using the footage. On June 10th the male juvenile fledged. It’s first flight didn’t go especially to plan – he flew into a window on the 14th floor. Fortunately he was ok, and it did give those on the inside a fantastic view up close. I was given a tip off, and thankfully had my camera in the building and so I was able to get some close up shots. 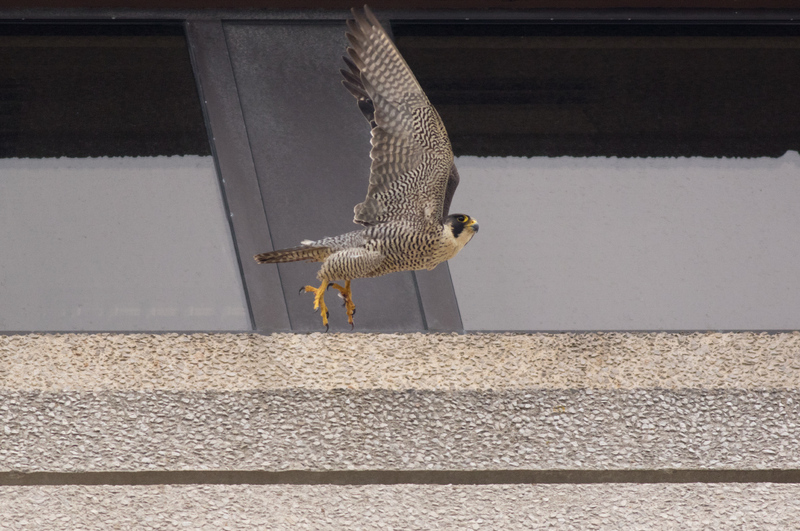 After spending an hour or so on the ledge, he took flight once more, this time ending up on the 10th floor. 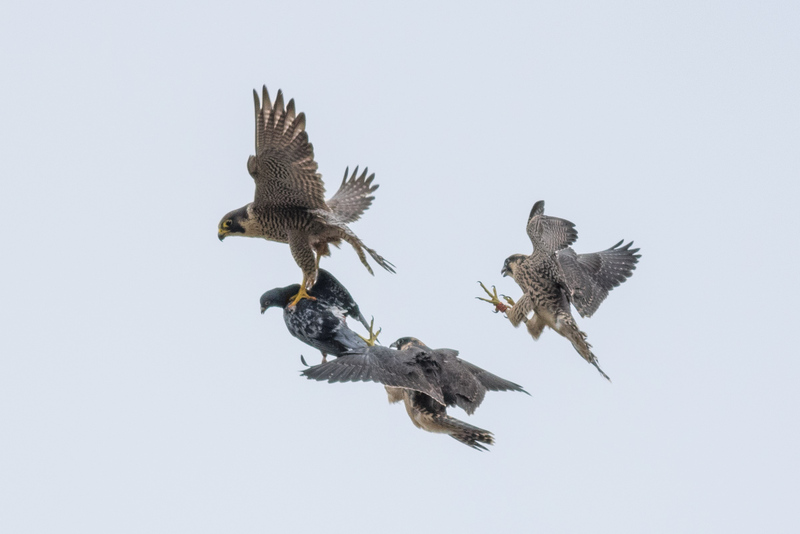 The female took rather longer to pluck up the courage, but four days later she too took to the skies. 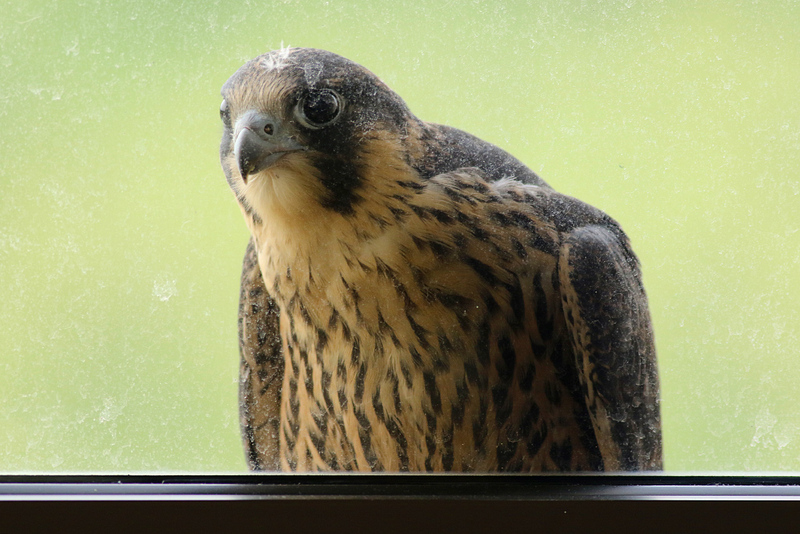 The male juvenile on a window ledge on the 14th floor, gathering himself after having flown into the window after its maiden flight. Thankfully he was ok. 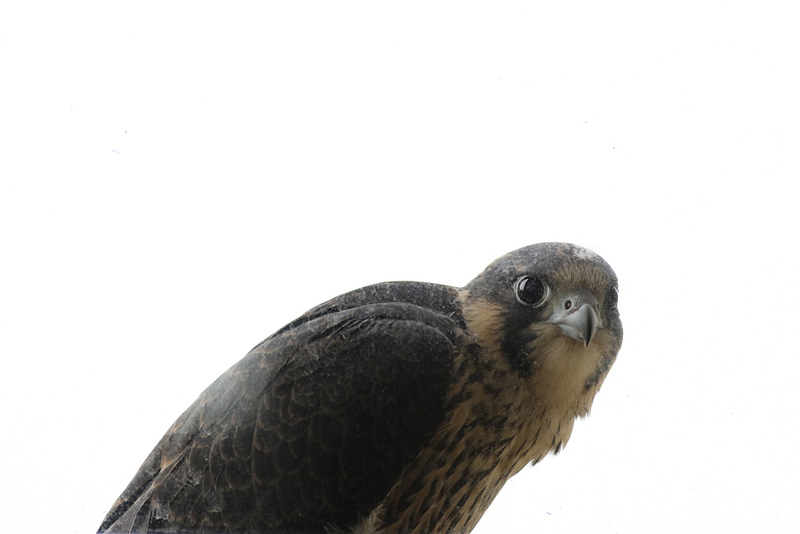 The view from outside of the male juvenile resting after its first day of flying. It stayed here for quite some time before making it back onto the top ledge. In a very short space of time they became adept at aerial acrobatics. 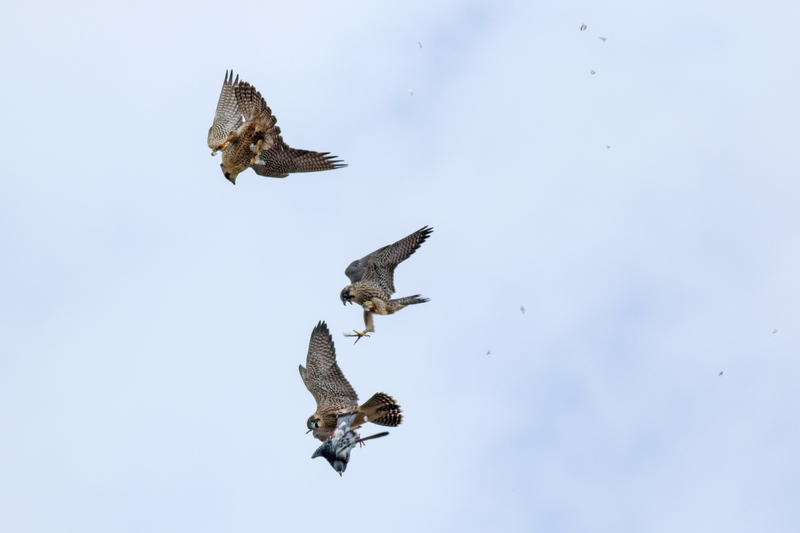 Seven days after the male first took flight I was able to capture a mid air food pass. It’s the one behaviour I was desperate to catch, and after popping out to the car park on the Friday after work, more in hope than expectation, one of the parents flew in with a freshly caught Pigeon. 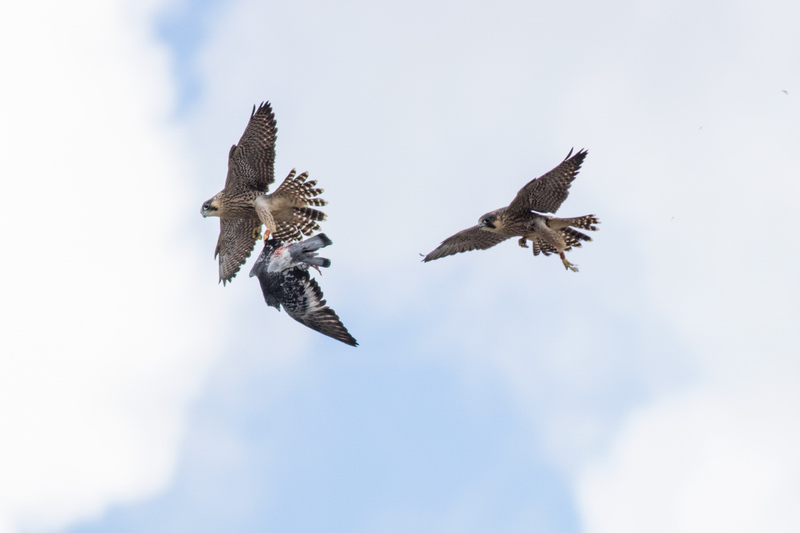 As she flew by the building both juveniles swooped down from the top ledge in hot pursuit, and attempted to wrestle the Pigeon from their parents grasp. Incredible to watch, and I counted my lucky stars. The one behaviour I really wanted to capture, and I was lucky enough to be in the right place at the right time. The project has been a huge success, with a happy ending, and we’ve had masses of support from visitors to the website. We’ll be continuing the project next year, and there’s even mention, if we can get the funding, of installing a second webcam outside the nest box so we can see what happens when the juveniles leave the nest. To see the full size images click here. 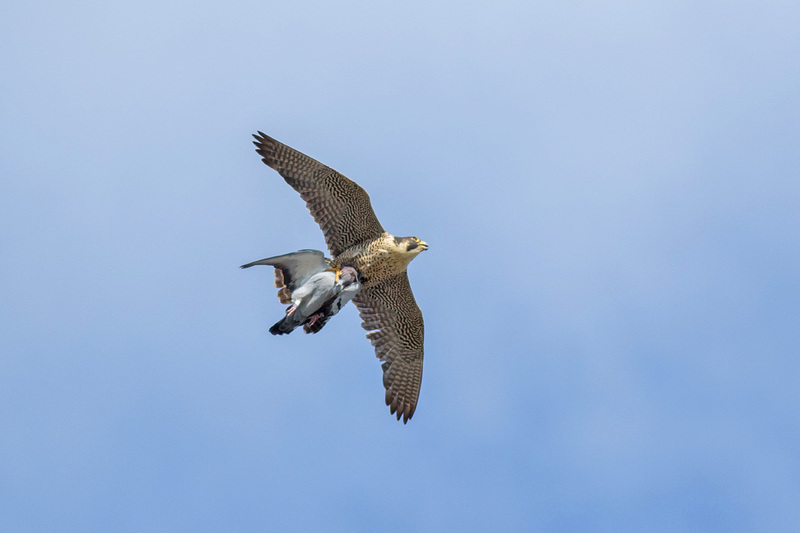 For more information please see the Woking Peregrine Project website here.